My daughter’s second birthday is this Sunday.. We have planning on having a big bbq with lots of friends and some family.. It will hopefully be fun - of course I am getting that preparty worry that I won’t have enough food or that the kids (or the adults!) won’t have fun.. Lots of good advice to be found on several websites - I really liked the parents who said to keep it simple and fun. I have bought some soft crowns with glitter pens and stickers and markers for everyone to decorate. We are going to bbq and have a pretty nice spread out with both kid friendly and grown up friendly foods.. A pinata. Some sidewalk chalk.. A little art station… A cooler full of cold drinks for kids and grown ups… Bubbles.. what else??? Ummmm… so far that’s all I’ve worked out.. But it sounds fun to me.. Anyone reading this, feel free to shoot some suggestions my way! Most of the people who read this entry will have no idea what I’m about to say. 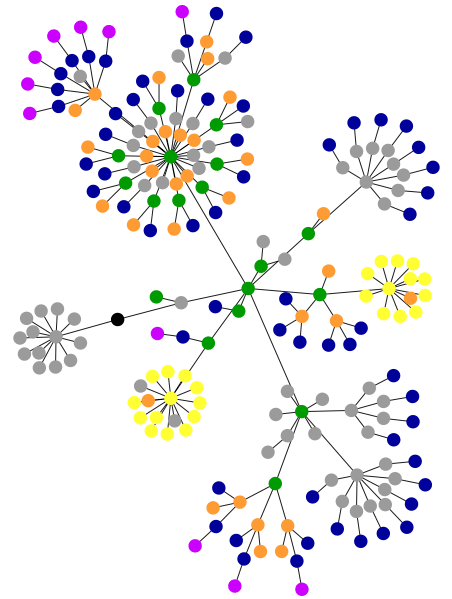 With that preface, I present to you the HTML DOM visualization of FamilyResource.com. HTML is the language Web pages are written in and the DOM is the document object model. In this case the DOM for HTML consists of objects like tables, anchors and images. Now that I’ve completely lost you, enjoy the art — I mean, the HTML DOM visualization of this website’s home page. You can create your own HTML DOM visualization at the Websites as Graphs Web page. Most people have tools and utensils that can be slippery to hold under certain situations. If only those things had some sort of rubber coating to help keep your grip. I recently ran across an excellent howto that shows you how to add grip to just about anything using Plasti Dip. You can buy Plasti Dip either as a spray for fabrics, or as a can for dipping tools and utensils into. To see how it’s done, visit MetkuMods website and read Super Grip with Plasti Dip. Cornell University has an intriguing section of their website that looks at schizophrenia, aging and art. The site captures the art of William Kurelek during his early onset of schizophrenia. 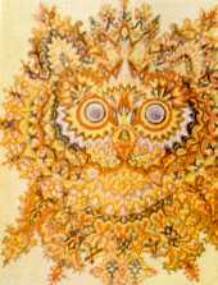 It also highlights Louis Wain, who experienced late onset of schizophrenia. One of the key features of Louis’ experience with schizophrenia involved the abstraction of his “cat” paintings. Over time, his depiction of cats became abstract — almost fractal — until they barely resembled cats at all. More art examples, references, and information on schizophrenia and art can be found at their Schizophrenia, Aging and Art website. National Gallery of Art in Washington D.C. is holding an exhibition devoted to some of the most famous works out of the Dada period. It is refreshing for me, someone who has taught art history/studio art off and on over the last three years, to see Dadaism getting a contemporary nod as one of the more interesting movements in the 20th Century. Flying in the face of what was “acceptable” and considered “important art” — artists like Duchamp, Arp, Richter were part of a time unlike any other. I’ll save the lecturing for my classes and let you peruse the sights yourself — it’s fascinating and wonderfully clever stuff. I went out a week or so ago to see a friend of mine play at a local venue — he was opening up for a very tightly polished band that will undoubtedly be successful in some aspect of music in the future. It was the first time I had ever seen my friend Travis play, he was fronting his band The Invisible Kids. Travis and I have a lot in common music and personal philosophy wise. It is one of those rare relationships you make in your adult life, besides your husband/wife and children, that mean something. I want people around me that have passion and work ethic associated with their art and Travis is one of those kids. I think I’ll know him for a long time to come — or at least I hope I do. What hit me that Saturday night, besides the blistering cold rain that wouldn’t stop, was that there is something really beautiful about young Americans. Perhaps I’ve jumped ahead of myself. Let me first explain my lack of vision first. I was raised in Europe, and as such, have had a very Eurocentric point of view about a great many things in my life. I moved back to the states when I was 13-years-old — this was, apparently, just the right age to feel as if everything I was leaving was idyllic and that everything I was going toward was a cultural wasteland. I have to admit, I still feel some of that is true. We are a young nation with a very shallow history — not shallow as in meaningless, shallow as in not well developed yet. Our traditions are slight and our sense of community is weak. These are things that you can deny but, in reality and compared to countries with thousands of years of history, are true. I’m getting away from my point though. My point is this: I saw, for perhaps the first time, a beautiful and amazing sense of innocence and naivety that night that was altogether shocking and breathtakingly beautiful. It happened when the band took a break and Travis brought up a friend of his to play a couple of duets. This said friend was German — his name was Gandalf. Gandalf had all the appropriate clothing and plumage for the part. Don’t get me wrong, he was a super talented boy who could write a brilliant song. I will, though, interject here that if I learned anything about stereotypical German behaviors living in Germany all those years, it’s that Germans like for things to be exactly as they “should” be. Hence, Gandalf was wearing his snakeskin cowboy boots and just the right amount of “metro-wear” to make him look edgy and not too country. Again I feel as if I need to interject my own point in saying that this has nothing to do with wardrobe — it has to do with passion and spontaneity and that innocence that I realized is very attribute to our culture. I will end the description of Gandalf by saying plainly that while I found him immensely talented, there was something too calculated about him that I couldn’t relate to. Everything was as it should be. There was no room for lovely, spontaneous interjections or sweat or, what did Bob Ross call ‘em, “happy accidents” — things that I have come to love as very typically American qualities. As those two boys, Travis and Gandalf, stood inches apart from one another singing the same song the imagery was so defiantly contradictory. Travis — full of so much love and passion for what he was doing that he could barely contain it within himself — became this metaphor for what I had been missing in my own culture for so long. In my lack ability to see only the decrepit sides of our country I was missing this — but how could I miss this when I felt it so strongly within myself? This fervor and idealism that I thought made me separate from my American heritage was really, in fact, because of it. Watching Travis on stage, with his very proud mother somewhere in this dark, dank bar watching her son as proudly as if he were a surgeon or a lawyer, was essentially watching a “becoming” that I think define our nation and set us apart from those other wizened older ones. Travis was the jazz age, the postmodern movement, the punks of the 70’s all standing before me in raw and unpenetratable energy — watching that sense of wonder embodied in someone I know and realizing that it is only in America that you can find that kind of dire, passionate, beautiful innocent and wonderful glory made me feel redefined and, finally, happy to be a young American.